Thomas Cook got back into deer hunting seriously in 2015 after about a 15-year hiatus from the sport, and on Nov. 24, he killed a buck that is “leaps and bounds above” any deer he’s ever shot. And he almost pulled the trigger on a doe instead. 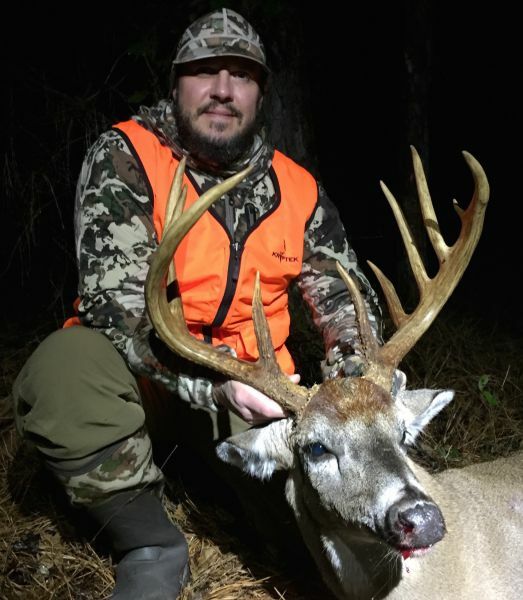 Cook’s 12-point Moore County buck had shown up on trail cams earlier in the season on the private land he hunts, but it was almost always at night. It wasn’t a deer he was specifically targeting, but he sure was happy to see it when he did. “I gave up hunting for a long time, but the landowner got me interested in it again when he took me on a turkey hunt in 2014. Then I started deer hunting seriously in 2015. I’ve been passing on smaller bucks all year, and I had decided to take a nice doe if I saw one to get some meat in the freezer,” he said. And after getting into his ladder stand overlooking a pine top clearing, he saw a perfectly sized doe, raised his rifle, and found the deer in his scope. He almost pulled the trigger, but the doe did something he had never seen before. “She turned her neck 180 degrees. Swiveled it all the way around like I’ve never seen before. I figured she was looking back at another doe coming up and I panned over to see what it was, and all I saw was brow tines and antlers,” he said. As he got a better look at the buck, Cook said it was one of those moments that you don’t have to look twice. “I knew right away it was a shooter,” he said. He’s pretty sure the doe noticed the movement of his rifle, but before she reacted, he pulled the trigger on his Tikka T3 Lite .308, killing the big buck. “I think she saw me move my rifle and just as I was squeezing the trigger, I heard her stomp,” he said. But it was too late for that to alert the big buck, which became Cook’s biggest hunting trophy to date. But it was more than just a trophy, and he had his wife help him recover the deer. “When we found it, we took a few moments to reflect on everything. We lost my father-in-law nine days before the hunt, and we named the buck Floyd in honor of him. That really meant a lot to both of us,” he said. Andy Spear Taxidermy is taking care of mounting the buck, and he estimated the green score at 144 inches.